Epoxy disasters. Every seasoned epoxy professional has had his fair share. Even though we tend to block out and conveniently forget these moments, these are actually the moments that will shape us into serious professionals. These are the learning experiences that let us acquire some skin in the game. Every single project has taught me something new. Every project has different conditions, different substrates , maybe different workers, and different expectations from the customer. I have compiled here a list of 7 stories that have gone wrong in my epoxy years. Mistakes that cost me greatly (sometime in the thousands of lost euros), but these mistakes have also helped me develop new ideas and teach others how to apply epoxies. Thanks to these mistakes I am able to spot problem projects and red flags from a mile away. This project was for a major multinational company… Like a MAJOR high street brand. And let’s just say that we were extremely fortunate the problem occurred on the base coat and not the topcoat. 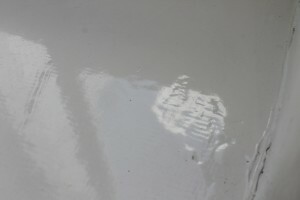 As we inspected the floor the day after the base coat went down, we noticed an area was wet and sticky. An area large enough to account for one pail of epoxy. It was obvious that the area in question had never cured. We went back and counted all the remaining A and B components. And not surprisingly, there was one extra B component. Apparently during the mixing one of the workers had forgotten to add the hardener for that pail. This was one of those projects that had lasted far too long and all of us just wanted to get it over and done with. We also had a very controlling and micro-managing customer was always expressing his opinion on how we should do the work.. ( I don’t mean to tell you how to do your job BUT…) Karma has a funny way of always making sure that things will go wrong with such customers. Anyway after doing some final sanding we just needed to apply the topcoat and “get out of there”. But due to a miscommunication, no-one actually swept and vacuumed the dust (!) I could forgive that, but I cannot forgive the worker who was applying the topcoat and dismissed the fact that the floor was dusty. Two days later, we went back to inspect the dried floor… and noticed that it had a weird matte texture filled with small dust and debris particles. Let’s just say that I got my first lesson in surface tension and cratering. Clear coats have this tendency to form fish eyes and craters. And I though I could rectify the problem by adding some thinner but then I realized that clear coats have a tendency to form bubbles that don;t go away! To this day I like to avoid clear coats. 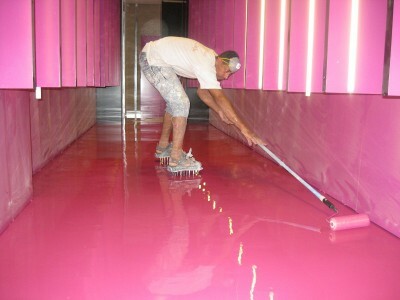 In fact this is one of the reasons why I am so sceptical of this latest epoxy 3d flooring craze. 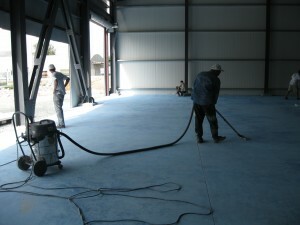 We all know that epoxy is not UV resistant, and sooner or later it will start to yellow and chalk. (Don’t trust suppliers who claim they have UV resistant epoxy – They are either selling you something else that is not epoxy, or they are outright lying). We were once working on this terrace exposed to a lot of sunshine throughout the day. And this was in a place in Greece where the sun shines 330 days a year. (Anyone who has visited Greece in the summer knows how strong the sun can be). The project site was on a busy commercial street. And the epoxy floor went all the way to the main entrance facing the street. As we finish a great looking floor, and locked up the door we left happy with a job well done. Two hours later, someone distributing pizza flyers would casually throw a flyer under the door. And that flyer would stick to the coating (argh!!!). The messiest part was explaining to the customer that fixing the floor would require either patching up the specific area or re-coating the entire floor. No-one likes to have a big patch on the floor as you enter the store. I wasn’t actually on site with this happened. But I used to have this worker who was always very opinionated, and was always sure of his choices (of course he never admitted his mistakes). So we had this one project where at the end the staff realised that the required quantities for the floor had been miscalculated, and as a result the remaining product was not enough to cover the remaining 7-8 square meters, so he took an executive decision without checking with me first. A very silly decision. He basically drowned the remaining epoxy in solvent to make sure that he could cover the area. The final result was absolutely horrifying. Adding this much solvent had left a surface with serious discolorations, blotches, and random chunks of quartz that looked like mud. 7. Wearing spiked shoes on soft epoxy. Ok this one is embarrassing as it happened to me again very recently. Temperatures were quite low and the epoxy was slow in drying. We put down the base coat and the next day we went back to add the topcoat. I had a worker back rolling the area with spiked shoes. Problem was (we realised an hour later) that the spikes were leaving imprints as the previous day epoxy was still soft. In some areas little bits of epoxy were coming apart and getting trapped with the new epoxy. The result was a disaster and we ended up needing to re-coat the whole thing. As a closing note, I would advise to keep a file with all your mess-ups, both the big and the smaller messups. This can be quite painful reminding yourself of difficult and stressful times. But having a systematic approach to keeping track of your mistakes, and things gone wrong, is a great tool for teaching new workers and educating your staff on possible risks. So finally I would like to hear from you. Do you have any great stories to tell? Do you think someone might benefit from this article? Please forward it along! And one more thing… If you feel you need to improve your knowledge on epoxy floors, our online course is the easiest and fastest way to do it. Click on the link to join! And here is one last video on what can go wrong with Epoxy Floors!